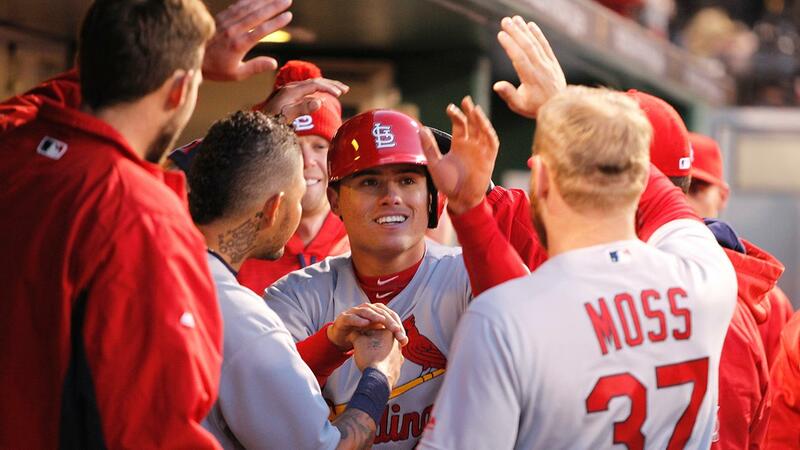 Aledmys Diaz notched one of an MLB-record three pinch-hit home runs the Cardinals produced en route to Friday's night's 7-4 win over the Braves, who remain winless despite holding a lead in the seventh inning or later in each of their first three games. The Cardinals were staring at the possibility of opening the season with four straight losses when the Braves tallied four third-inning runs off Jaime Garcia. But Garcia found a groove over his final three frames and St. Louis began its comeback during a three-run fourth against Matt Wisler, whose 6 2/3-inning effort was tarnished by Jeremy Hazelbaker's game-tying pinch-hit dinger in the seventh. Diaz's eighth-inning solo shot off lefty Eric O'Flaherty accounted for his first career dinger. The Braves had gained a comfortable early lead courtesy of three consecutive two-out RBI singles by Nick Markakis, Hector Olivera and Tyler Flowers off Garcia. K-Oh: Cardinals reliever Seung Hwan Oh, making his third big league apperance, notched his sixth -- and biggest -- strikeout yet this season by getting cleanup hitter Adonis Garcia to swing through three sliders with one out and the potential go-ahead run on third in the seventh. Oh then handed the ball to Kevin Siegrist, who stranded the pair of runners by inducing an inning-ending forceout. It was the first of three scoreless innings by the Cardinals' bullpen. Bullpen moves: When Hazelbaker was announced as a pinch-hitter in the seventh, the Braves had the option to force the Cardinals' hand by bringing their only left-handed reliever -- O'Flaherty -- out of the bullpen. Instead, they brought O'Flaherty out to begin the eighth, which gave the Cardinals a chance to replace the left-handed-hitting Matt Adams with Diaz. Hazelbaker stays hot: Since winning a roster spot on the final day of camp, Hazelbaker has emerged as the Cardinals' biggest offensive weapon. He hit his second long ball of the season on Friday, this one a game-tying solo shot while pinch-hitting for Garcia in the seventh. Hazelbaker joined Joe Cunningham (1954) as the only Cardinals with two home runs in their first four career games. Unfazed by misfortune: Before making a mistake on the fastball Hazelbaker drilled over the right-center field wall, Wisler had retired eight straight batters after encountering some bad luck during the Cardinals' three-run fourth inning. The Braves' right-hander might have exited the inning unscathed had left fielder Olivera not initially broken back on a Matt Adams single that fell in shallow left field. Still, despite surrendering four rather soft hits during the frame, he quickly righted himself and showed the maturity he has gained since last year's rookie campaign. The Cardinals lost their challenge in the seventh inning after the umpires reviewed a play at second base. Matt Carpenter had been called out trying to stretch a single into a two-base hit. The call stood following a one-minute, 40-second review. The umpires utilized a crew chief review in the eighth to take a second look at a pickoff ofKolten Wong to end the inning. Replay confirmed the ruling on the field. Cardinals: Right-hander Carlos Martinez will make his season debut on Saturday, when the Cardinals continue their series in Atlanta. First pitch at Turner Field is scheduled for 6:10 p.m. CT. Martinez dazzled this spring, striking out 16 batters over 15 ⅔ Grapefruit League innings. Braves: Julio Teheran will make his second start of the season when Atlanta resumes its three-game series against St. Louis at 7:10 p.m. ET. Teheran did not get a decision after limiting the Nationals to two solo homers over six innings on Opening Day.